The saga of David Blunkett's tangled love life and resignation from the Cabinet is to be turned into a musical. Producer Martin Witts said the former home secretary's life had all the ingredients for a West End hit. He described the show, which will feature jazz, rap, opera and R&B, as a "tribute to a Sheffield hero". Mr Witts' previous productions include Prisoner Cell Block H - The Musical and Hurricane, based on the life of snooker player Alex Higgins. Mr Witts said a "well-known rock star" had been lined up to play Mr Blunkett. The show will also feature a sub-plot based around Spectator editor Boris Johnson's alleged affair with columnist Petronella Wyatt, and Mr Johnson's trip to Liverpool to apologise for the offence caused by a piece in his magazine. Mr Witts said the show would open in the West End in April, before playing at the Edinburgh Festival. It is being written by journalist Ginny Dougray, who has interviewed all of the principal characters in the past, with music by American composer MJ, who has worked with Kinks singer Ray Davies. Songs from the show will receive their world premiere on Saturday in front of an audience of former miners at the Grey Horse pub in Elvington, North Yorkshire. 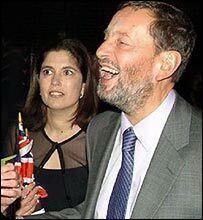 Mr Blunkett resigned from the Cabinet in December after an investigation linked him to the visa application of his former lover's nanny.